Hello! I'm currently headed to Seattle for work but wanted to do a quick recap of an amazing Half Marathon I ran yesterday! 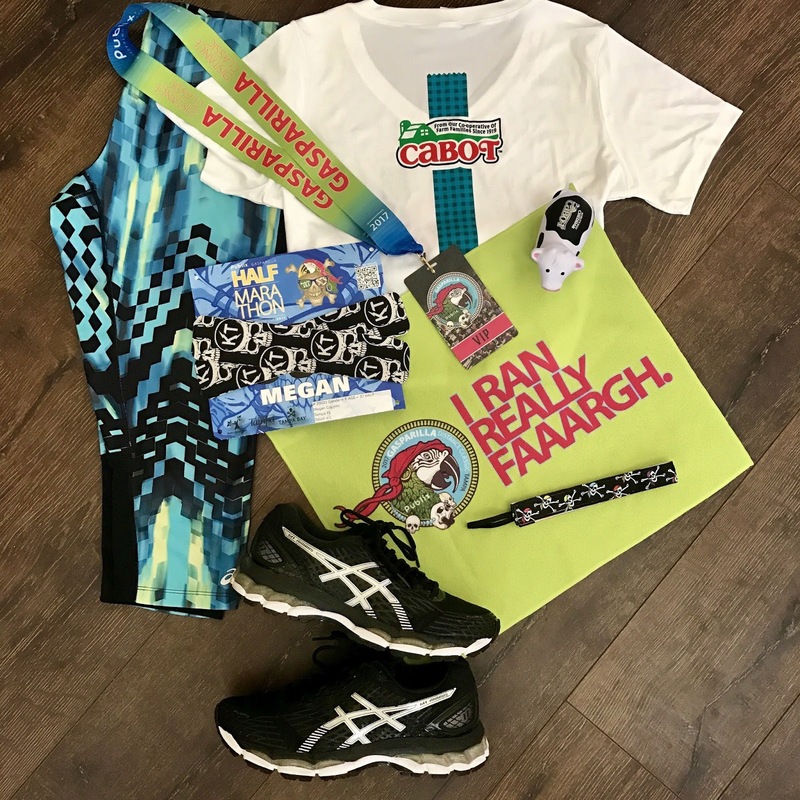 A few weeks ago, I was invited by my friends at Cabot Cheese to be part of their #CabotFit team during The Gasparilla Distance ClassicWeekend. I planned on only running the 5K being I have not ran long distance since Avengers Half Marathon in November. Given this was my first time participating in Gasparilla Distance weekend, I caved in and registered for the Half Marathon. This is a bucket list race for me. I have never been in town for Gasparilla Half Marathon weekend due to conflicts with Princess Half Marathon, Rock n Roll NOLA or work. Come Saturday, I found my self a ball of nerves. I have been traveling for work non-stop this month and planned on doing at least 2 longer runs leading up to the race. The most I got in was 5 miles. Not good. However, I have been doing Orange Theory Fitness 2-3 times a week for the past 2 months and have noticed a huge increase fitness wise. More on that! My alarm clock went off at 4:30am and I had to smile at the extra time I got to sleep in compared to all my friends running Princess Half Marathon. After my 30 minute drive to Channelside (boy did I miss living 2 miles away that morning! ), I parked and headed to the start line but was not feeling it whatsoever. I heard my name and saw my friend Marcia, who is the Social Butterfly for Run Donna. My mood instantly changed and she ended up becoming my impromptu running buddy. Marcia told me she was running 2:00/0:30 intervals which worked for me. It was very windy and chilly at the start of the race but knowing the weather was going to get to the mid-80's later that day, I welcomed the chill in the air. We started off going over the Davis Island bridge and saw two Cruise ships coming into port. 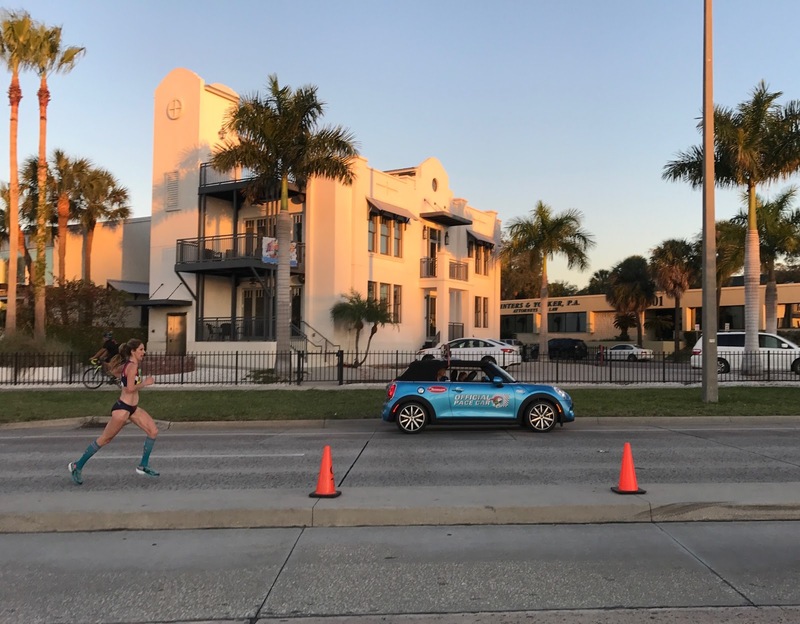 All those sleeping passengers coming back home from vacation had no idea they cruising past thousands of people running Gasparilla Half Marathon! We were on Davis Island for about 5 miles and the support of the residents was amazing, especially that time of morning. One house had mimosas lined up. I want to be their friend :) We saw a fire juggler and plenty of pirates. The sun was up once we got onto Bayshore Blvd. 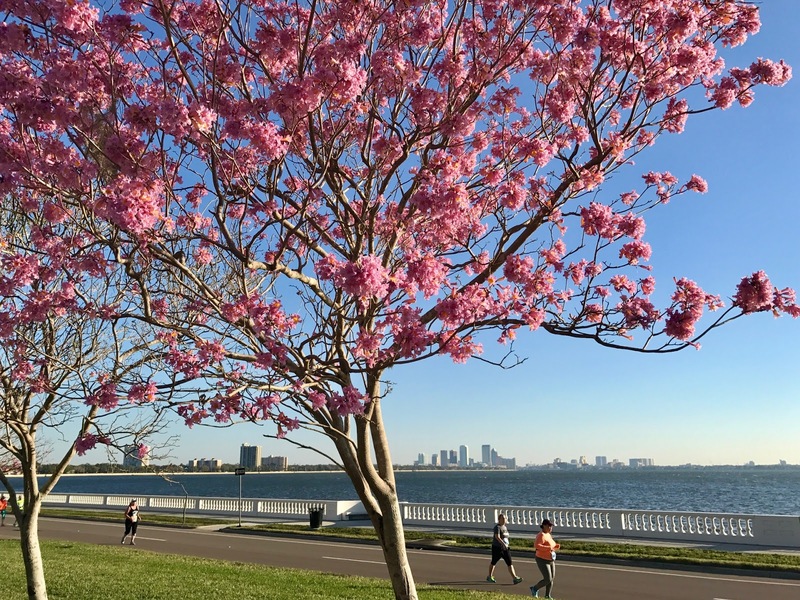 Bayshore is very popular with Tampa runners for many reasons. It's beautiful and has the longest continuous sidewalk in the world. On a lucky day, you can run alongside dolphins and other sea life. 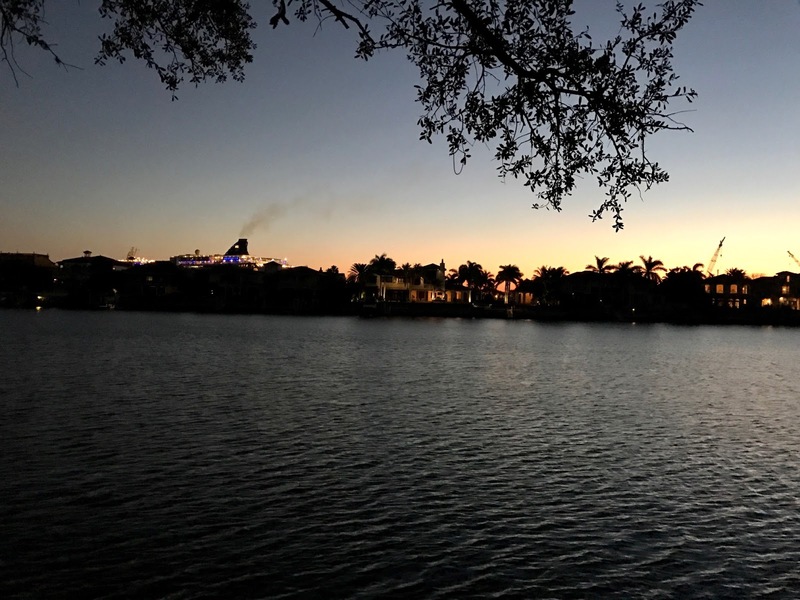 Bayshore doesn't have any tree's covering you from the sun on the waterside - so we pushed through our intervals to get over to the street side asap. Once we got onto Bayshore, the leaders were passing on the opposite side of the road. We passed a few of the guys but got the opportunity to see Stephanie Bruce, the winner of Gasparilla lead the women through the field. Marcia commented "we just had our fastest mile" around 7 or 8. We unknowingly had a tailwind. The second we looped around, we were hit face on with a very strong headwind. I honestly think we were running in place at some points. We did see a T-Rex at this point and both of us made a character stop comment, so we had to get a photo! I felt great until mile 11. My feet hurt. They hurt to walk. They hurt to run. They hurt standing still. Luckily about this time, we ran through the Boys and Girls club where 100's of kids were out cheering us on. This was such an awesome moment of the 13.1 miles. I kept up with the intervals until mile 12.5 and then slowed down to 0:30/0:30. Talk about a mental battle. I was so disappointed in myself that I couldn't keep up for a half mile to cross the finish line w/ Marcia. Going back in time, my last non-Disney race was Rock n Roll Nashville in May 2016 where we finished the half marathon a little shy of 3:00 (hills!) and before then was Rock n Roll New Orleans where my husband ran for the first time in over a year and our finish time was also around the 3 hour mark. This was not a fast race by any means but I finished at 2:39, which was a 20 minute improvement from last year. Without any distance training since November, I was very happy with myself. I also couldn't have done it without Marcia. So I took a page out of her book and got a Five Guys Burger - and instead of pairing it with Sam Adams as she typically does, I drank a bottle of Champagne :) If you are looking for a nutritious way to fuel after the race, check out Cabots Peach Recovery Smoothie. 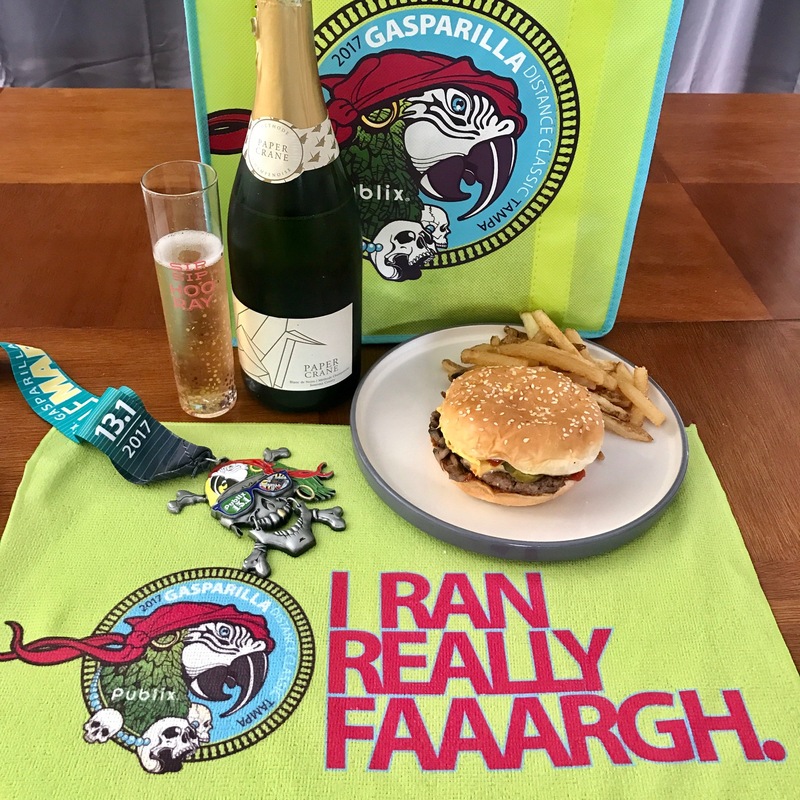 I had a fantastic time at Gasparilla Half Marathon and I absolutely suggest running it. Amazing course, great crowd support, pirates everywhere, awesome medal and Columbia Restaurant catered food for the finishers. You can't ask for more! 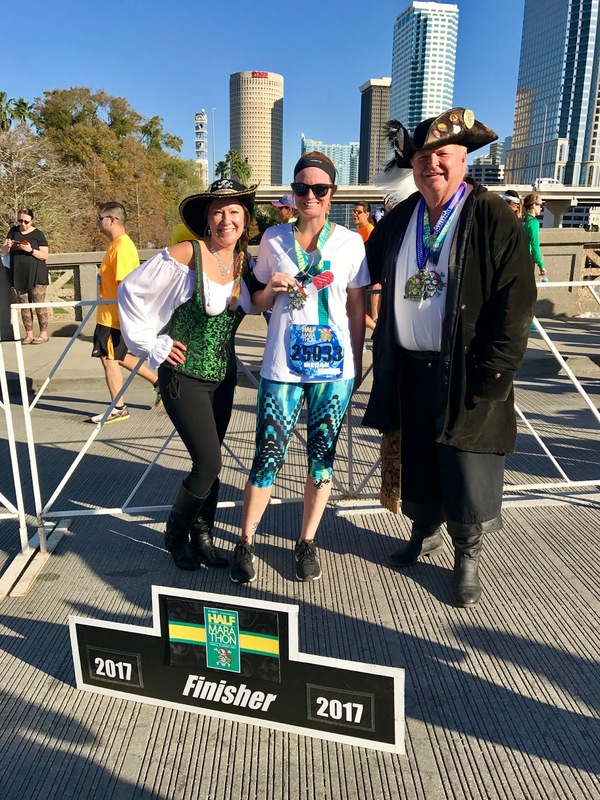 If you are thinking of running Gasparilla next year, be sure to check out the Treasure Chest Challenge with Run Donna. Runners who finished either the Donna 13.1 or 26.2 in January and ran the Gasparilla Half Marathon took home this giant medal, which opened up as a treasure chest!